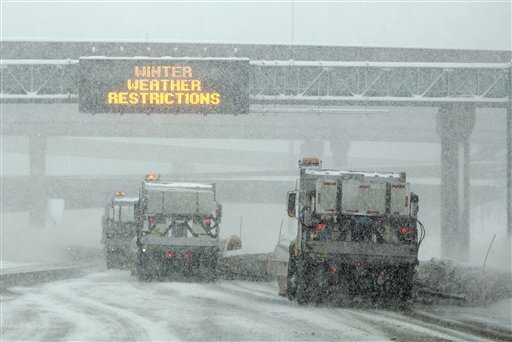 HARRISBURG, Pa. – The Pennsylvania Department of Transportation (PennDOT) and PA Turnpike are advising motorists to closely monitor weather forecasts and conditions as a storm brings mixed precipitation types to much of the state, with many areas expected to see precipitation during the Monday evening and Tuesday morning rush hours. Due to potential snowfall and anticipated sleet or freezing rain along with balancing needs for goods movement, PennDOT and the PA Turnpike are implementing phased restrictions through the storm. Depending on conditions, restrictions may be expanded or reduced. 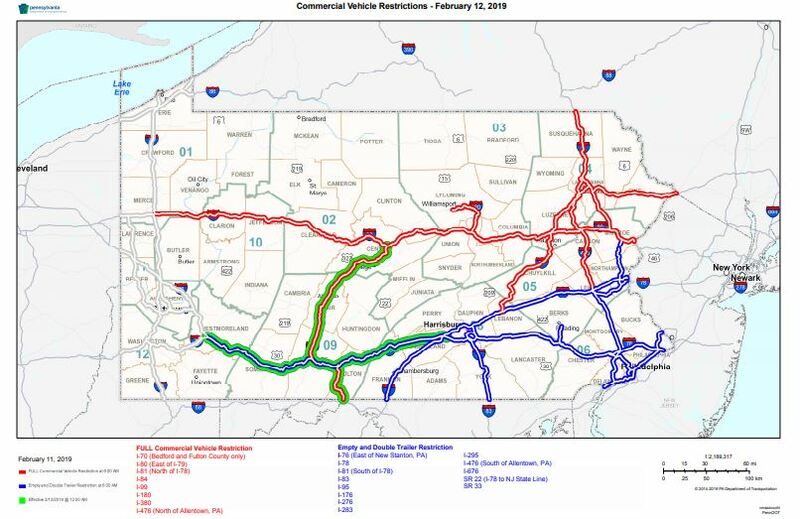 See a map of planned restrictions (PDF) at www.penndot.gov, and when restrictions are effective, they can be viewed at www.511PA.com. A 45-mph speed restriction will be in place on all roadways with vehicle restrictions at least during those timeframes and may be implemented sooner and on non-vehicle-restricted roadways as well. 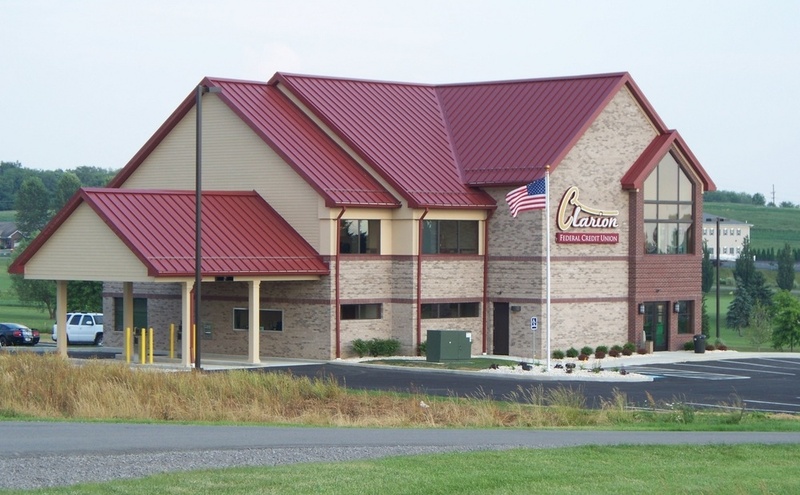 To help make decisions regarding winter travel, motorists are encouraged to “Know Before You Go” by checking conditions on more than 40,000 roadway miles, including color-coded winter conditions on 2,900 miles, by visitingwww.511PA.com. 511PA, which is free and available 24 hours a day, provides traffic delay warnings, weather forecasts, traffic speed information and access to more than 860 traffic cameras. Users can also see plow truck statuses and travel alerts along a specific route using the “Check My Route” tool. A vehicle emergency kit should be prepared or restocked containing items such as non-perishable food, water, first-aid supplies, warm clothes, a blanket, cell phone charger and a small snow shovel. Motorists should tailor their kits to any specific needs that they or their families have such as baby supplies, extra medication and pet supplies. To report an accident or other emergencies on the PA Turnpike, dial *11 on your mobile phone. If there is an accident, move the car out of travel lane and onto the shoulder, if possible, and stay in the vehicle. For more information about PA Turnpike conditions, follow the conversation by using www.paturnpike.com/travel/twitter.aspx. You may also see advisories by clicking on the travel ticker on www.PATurnpike.com.